As a veteran digital designer with over 10 years in the industry, I am always trying to make sure that my designs look and work great in any OS environment. This is why I created a habit of rigorously testing my design solutions for any and all devices users might be employing. In this regard, probably the biggest issue I always had was the difference between the Mac and the PC, meaning the macOS and the Window operating systems. The issue has not been just the fact that these utilize different browser setups, but also how they work with their applications in a different manner. Because of this, I regularly came across many design problems that were related to the issue of compatibility and OS optimization. Before in my career, I was forced to own two working computers, one PC, and one Mac, so I could properly test and check out the designs I was implementing. Being that I was always working as a part of the team, this two-rig system lead to many problems I was causing to the overall development. But then, all of a sudden, I came across a coupon offer that was simply too good to be true – a software package, which was even at a discount, was offering to provide me with the dual macOS and Windows environment on the same computer. At first, I was skeptical but then I decided to purchase it and I was amazed by the power and usability Parallels Desktop provides to its users. Simply put, the software package is able to mimic a different operating system by running it in a primary OS environment as a virtual machine. For me, this means that I run Windows 8 inside of my macOS, right there, but only in a separate window. This allows me to test out whatever I need but not to boot up my system every time I make this switch or to go to a completely different computer. Not only this, but the software also comes with the full support for Linux and ChromeOS operating systems. I do not currently employ these, but it is great to know that if I need them, Parallels Desktop is here to provide them to me. Aside from the clear benefit of having a unified solution for my two main OS environments on a single computer, the Parallels Desktop comes with some additional benefits. The capacity of the virtual machine it runs is impressive, so a virtual OS can easy run complex programs and even next-generation videos games without any issue whatsoever. At the same time, its requirements are more than satisfactory, meaning that it will not deplete the primary computer’s processing power or RAM usage. The developers of the software were fully aware that it will be used for things like backward compatibility, which is the reason why it comes with many legacy systems years or even decades-old, all of which can be setup as a virtual machine. 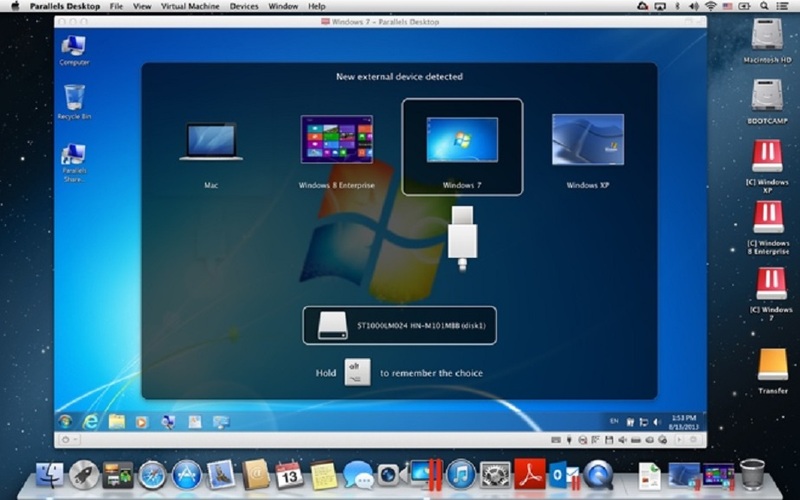 Finally, the well-configured virtual machine run by Parallels Desktop can even communicate with bluetooth devices and other peripheral elements of a computer.